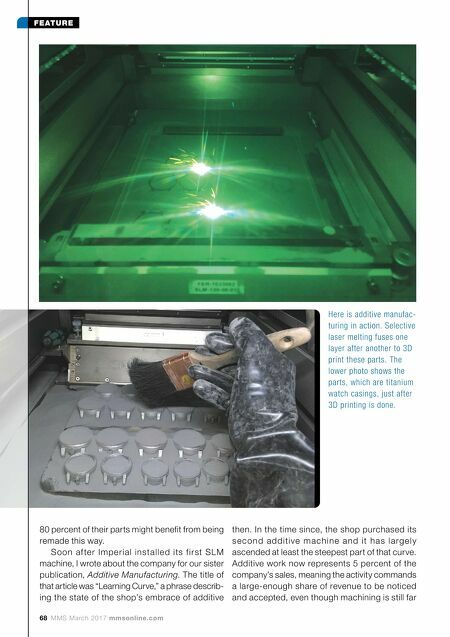 mmsonline.com March 2017 MMS 69 FEATURE What used to be a solid plate with drilled holes for cooling was replaced by a 3D-printed network of cooling channels that eliminated unnecessary mass and material of the plate. However, the reduction in weight came with an increase in com- plexity. The part itself is proprietary and therefore not shown, but here is the fixture Imperial's team developed to hold it during machining. Chris Joest has integrated additive into a process in his shop in which the needs of machining are taken into account during the planning stages for any 3D-printed job. and away the core of its business. Thus, Imperial today illustrates what it looks like for additive manufacturing to be accepted. The shop offers a preview of something other manufacturers likely will also come to see in their own shops—namely, additive manufacturing and CNC machining coming together as two routine parts of produc- tion. At Imperial, the biggest part of that coming together consists of the additive staff and machin- ing staff working together to arrive at a process- ing strategy for every 3D-printed job that makes the best use of both these capabilities. 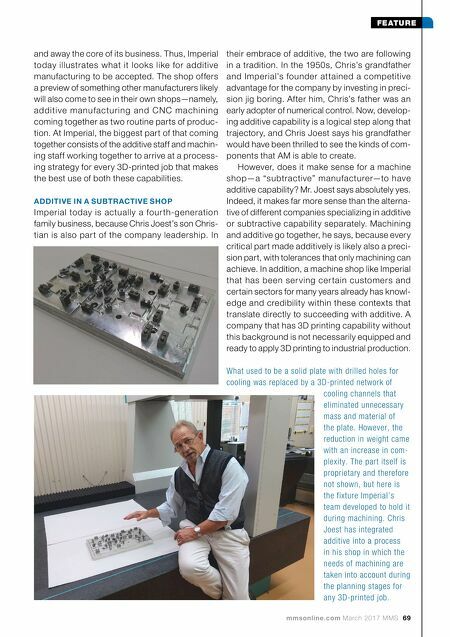 ADDITIVE IN A SUBTRACTIVE SHOP Imperial today is actually a four th-generation family business, because Chris Joest's son Chris- tian is also part of the company leadership. In their embrace of additive, the two are following in a tradition. In the 1950s, Chris's grandfather and Imperial's founder attained a competitive advantage for the company by investing in preci- sion jig boring. After him, Chris's father was an early adopter of numerical control. Now, develop- ing additive capability is a logical step along that trajectory, and Chris Joest says his grandfather would have been thrilled to see the kinds of com- ponents that AM is able to create. However, does it make sense for a machine shop—a "subtractive" manufacturer—to have additive capability? Mr. Joest says absolutely yes. Indeed, it makes far more sense than the alterna- tive of different companies specializing in additive or subtractive capability separately. Machining and additive go together, he says, because every critical part made additively is likely also a preci- sion part, with tolerances that only machining can achieve. In addition, a machine shop like Imperial that has been ser ving cer tain customers and certain sectors for many years already has knowl- edge and credibility within these contexts that translate directly to succeeding with additive. A company that has 3D printing capability without this background is not necessarily equipped and ready to apply 3D printing to industrial production.